Harrison (United States) (AFP) – David Beckham watched Ellen White’s double strike spare Phil Neville from a first defeat as England women’s manager in the SheBelieves Cup on Sunday. The former Manchester United midfielder was at the Red Bull Arena to see old friend Neville in managerial action but witnessed a disappointing defensive display only for Birmingham City striker White to save the day with a 73rd minute equalizer to hold multiple European champions Germany to a 2-2 draw. Neville’s side arrived in high spirits after the opening SheBelieves Cup thrashing of France last Thursday. They will now take on the United States in Orlando on Wednesday, aiming to end their campaign with a win over the reigning world champions. Beckham surprised the squad with a pre-match pep-talk. 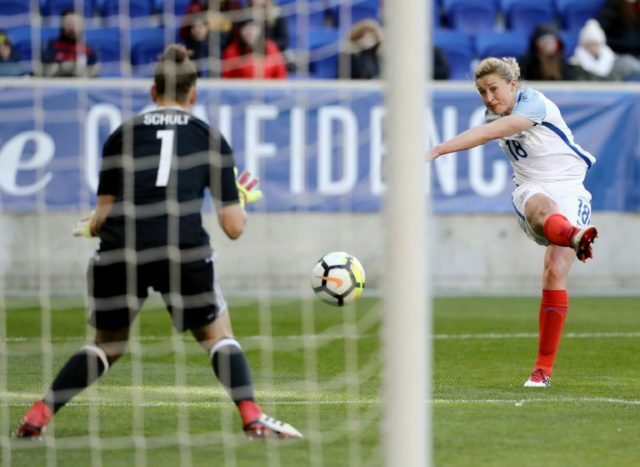 The 42-year-old was in town to see Neville get to work and the former England captain, sitting high in the stands, witnessed a cagey start from the Lionesses against the team ranked number two in the world behind the USA. “The minute I got the job David said he would come to the game,” Neville said. “He said a few words about what it means to play for England and gave caps to Siobhan Chamberlain for her 50th and Abbie McManus for her first the other night. “His presence shows how far the women’s game has come in England. He would have liked the way we played. Germany were a level above the French, who drew 1-1 with the hosts in the opening match of the day, and on 17 minutes they were ahead. England’s backline failed to deal with danger inside the box and the ball finally squeezed past Chamberlain via Hasret Kayikci. It was a sloppy goal to concede but just a minute later England were level. Williams let fly from 20 yards and her well-struck effort was deflected home by White. On 22 minutes the Lionesses should have been ahead. Lucy Bronze and Fran Kirby helped tee up White but the Birmingham City striker curled wide. The chances kept coming for Neville’s side with Demi Stokes firing over from 20 yards. It was more of the same after the break, and Kirby should have put England up just after the restart but dithered in front of goal. On 51 minutes disaster struck. Woeful defending saw McManus and Chamberlain get in a terrible tangle and as the ball was eventually fired forward by Lina Magull it was saved by the England keeper’s feet but went in off Bright for an own-goal. White, however, kept a calm head on 73 minutes to help her team earn a creditable draw. “I was disappointed but I spoke to my staff and they reasoned with me,” Neville said. “There’s not many teams who have created that amount of chances against Germany. Earlier, Eugenie Le Sommer’s 38th-minute goal levelled it for France after Mallory Pugh had given the United States the lead. The French had crashed to an emphatic 4-1 defeat to England in Columbus on Thursday. Against the United States Les Bleus were much improved, responding superbly from falling behind in the 35th minute to Pugh’s ninth international goal. Megan Rapinoe sent a free-kick into the area which caused mayhem in the French defence. The ball was ricocheting around before Pugh stabbed home via the hand of goalkeeper Sarah Bouhaddi. France held their nerve and in the 38th minute, just moments after Valerie Gauvin hit the bar, Lyon forward Le Sommer broke clear of the defence and coolly rounded Alyssa Naeher.